What is another word for only? 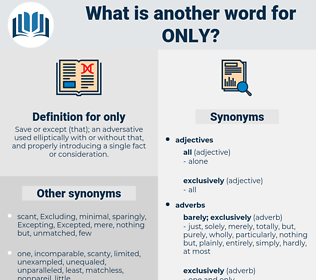 Save or except ( that); an adversative used elliptically with or without that, and properly introducing a single fact or consideration. purely, mere, strictly, unattached, one-stop, one-off, one-size-fits-all, lonesome, little, vain, once-in-a-lifetime, Len, merely, very, common. purposes, individuals, techniques, reasons, documents, Records, Respondents, concerns, practices, Soils, registers, Goals, releases, units. barely, purely, entirely, scarcely, hardly, so, however, completely, absolutely, totally, singly, necessarily, strictly, single-handedly, independently, individually, still, precisely, yet, nevertheless, once, rather, recently, perfectly, marginally, certainly, currently, longer, also, little, quite, rarely, apart, approximately, newly, unsuccessfully, fully, soon, slightly, then, neither, merely, very, firstly. Relied, Was, Remained, tried, Meant, fell. Applying, affecting, appearing, saying, going, getting. applies, contains, accounts, wants, falls, takes, Does. garden, common, worse, motley, ubiquitous, miscellaneous, inferior, ill, bush-league, poor, lower, household, recurrent, lesser, lousy, low-grade, terrible, normal, execrable, pathetic, low, inclusive, perennial, second-rate, assorted, usual, wretched, vile, unsatisfactory, unacceptable, awful, everyday, patchwork, depressed, commonplace, varied, prevalent, deficient, popular, heterogenous, bush, lame, rotten, bad, mediocre, atrocious, promiscuous, multiple, wanting, repeated, mixed, paltry, routine, worst, off, prevailing, substandard, dissatisfactory, ordinary, rampant, punk, frequent. It not only can be, but is! No darling, not my father, only my husband.